We might not have made it to our final Bangladeshi park if the concierge in our hotel had had his way. When I explained to him that we wanted to go to Dream Holiday he told me in no uncertain terms that it would be exactly the same as where we'd been the day before, and that there were many better things to see in Dhaka. He seemed somewhat disconcerted when I insisted that we'd like to go to the park first and then on to some sightseeing if possible, and told us that there wasn't enough time in the day to do that given our evening flight. He was wrong, as it happened, but by the time we realised that there was little to do except spend some time chilling in the hotel. Dream Holiday is located roughly ninety minutes drive from Dhaka via a toll road that costs the princely sum of BDT 60 (~€0.66) in each direction. That money covers a sealed route that is, if not of western standard, at least several steps above the norm for the area making for a moderately pleasant journey. The parking area was completely full when we arrived, but our driver gave us his phone number and told us to call him when we were ready to go. This worked out just fine, though readers retracing our steps would be well advised to make sure that their mobile provider has a roaming agreement in Bangladesh, as only one of our three phones worked properly. Roller Coaster (#2209) carries a plate crediting it to a company named Mac Systems in Kolkata. From a distance the ride looks like a small model Pinfari Zyklon, but on closer inspection it becomes apparent that it is a unique design that can be thought of as a Wacky Worm with a bonus helix added above the regular stacked figure eight. The ten seat train is vaguely reminiscent of a Zamperla Dragon, albeit without the onboard motor, and it delivers powerful laterals while negotiating the compact course. The clearances probably wouldn't meet western safety standards, and given that passengers are strongly advised to keep arms and legs inside the ride at all times. 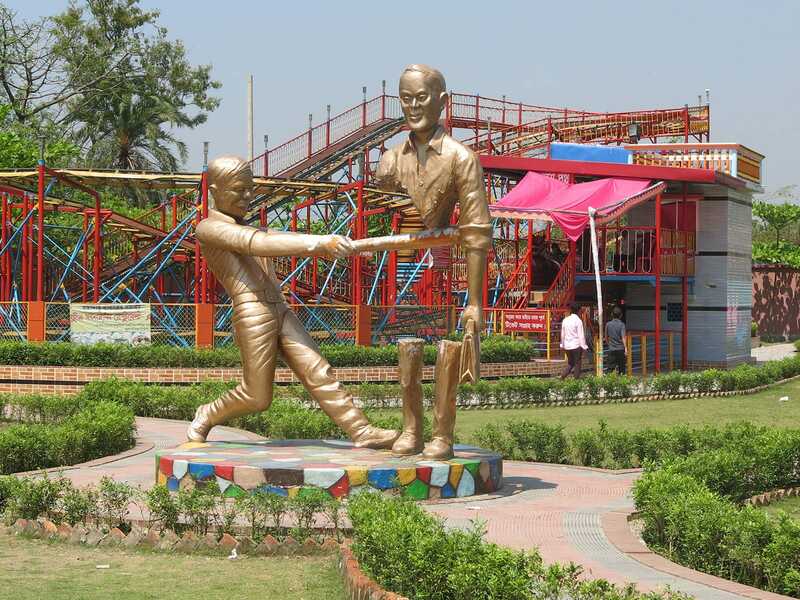 The coaster stands right next to Nooter Bari, a rather good walkthrough with a bit of an identity crisis. The outside features a sculpted mountainside structure painted with a snow-like texture that is decorated with several climbers and a colony of penguins. The inside starts with a vortex tunnel accompanied by the Jaws theme, then proceeds into a short but exceptionally detailed haunted house with an armed security guard (! ), live actors, and extremely high quality static scenery. There was a token animatronic coffin lid that creaked ominously as we walked past. We exited the walkthrough to an an involuntary repeat of our celebrity photo sessions from Chittagong, as almost everyone in the park wanted their photograph taken with the three crazy tourists. The vast majority of the paparazzi were tilting their cameras to a 45-degree angle, a somewhat curious local fashion followed by teenagers and adults alike. When we eventually escaped we began a slow walk around the park. Most of the rides were generic, though we did spot a speedboat ride that we'd happily have tried if the queue had been shorter. The highlight of the place for us was the bizarre collection of statues and sculptures, including a stone statue taking a selfie with a mobile phone, a cyclist made out of recycled chains, and a formally dressed businessman with a briefcase whose entire midsection had just been removed by an errant baseball bat. Hazrat Shahjalal International Airport has a security check on the way into the building, and the queue today was absolutely enormous. As westerners however we didn't need to worry; a uniformed security guard came to us when we disembarked from our hotel car, and escorted us directly to the front of the queue, then again to the front of the queue for our flight check-in, and finally to the front of the queue for passport control. The time saving from this was well worth the small baksheesh, allowing us plenty of time to relax in the departure lounge.